As the influence of the internet has grown, so has its importance for human rights documentation. This explosion of content has created new challenges and opportunities. While more human rights documentation is definitely better, it’s not always easier. One of the major challenges that we’ve aimed to tackle in recent years is how to verify and find contextual information about pieces of citizen media. This topic has become a primary focus of our curation, advocacy, and training work. And for the last few years, along with the digital security collective The Guardian Project, we’ve been working on a tech approach with the CameraV app. With my 2015 eyes, if I could go back and fund anti-censorship tools, I'd worry less about circumvention and more about verification. 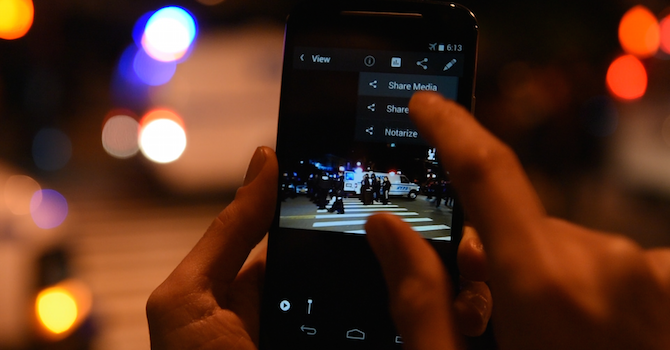 CameraV has come a long way in the last few years, and we’re excited to share it with more activists, human rights documenters, and citizen journalists who could benefit from creating media that is both secure and verifiable. CameraV helps make that possible by grabbing all of the data created by a phone’s sensors — time and location, but also movement, light, surrounding signals, and more — and embedding it into your photo or video so it can be checked later. That helps ensure that the media hasn’t been manipulated and, in the more common case, that it isn’t being shared with the wrong context or backstory. The video above gives a quick walkthrough of how CameraV works.And to get started yourself, head to the play store and download CameraV. For more background on how the app came to fruition and how it’s being put to use, watch the “A Bigger Brother” episode of Al Jazeera’s “Rebel Geek” series dedicated to the app.